Abstract. Portable energy-dispersive X-ray fluorescence spectrometers (p-ED-XRF) have become increasingly popular in sedimentary laboratories to quantify the chemical composition of a range of materials such as sediments, soils, solid samples, and artefacts. Here, we introduce a low-cost, clearly arranged unit that functions as a sample chamber (German industrial property rights no. 20 2014 106 048.0) for p-ED-XRF devices to facilitate economic, non-destructive, fast, and semi-continuous analysis of (sediment) cores or other solid samples. The spatial resolution of the measurements is limited to the specifications of the applied p-ED-XRF device – in our case a Thermo Scientific Niton XL3t p-ED-XRF spectrometer with a maximum spatial resolution of 0.3cm and equipped with a charge-coupled device (CCD) camera to document the measurement spot. We demonstrate the strength of combining p-ED-XRF analyses with this new sample chamber to identify Holocene facies changes (e.g. marine vs. terrestrial sedimentary facies) using a sediment core from an estuarine environment in the context of a geoarchaeological investigation at the Atlantic coast of southern Spain. 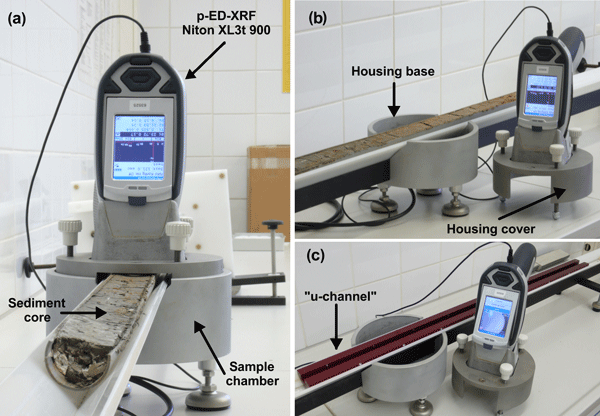 How to cite: Hoelzmann, P., Klein, T., Kutz, F., and Schütt, B.: A new device to mount portable energy-dispersive X-ray fluorescence spectrometers (p-ED-XRF) for semi-continuous analyses of split (sediment) cores and solid samples, Geosci. Instrum. Method. Data Syst., 6, 93-101, https://doi.org/10.5194/gi-6-93-2017, 2017. This paper introduces a hands-on, low-cost device (German industrial property right no. 20 2014 106 048.0) that uses common adapters to mount p-ED-XRF devices so that these can provide bulk-sedimentary chemistry data from non-destructive measurements at the surface of a split sediment core or from other solid samples. 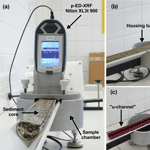 The strength of combining p-ED-XRF analyses with this new sample chamber is demonstrated by exemplary sediment cores from an archaeological research project.